Although I am an American, I feel as though the new year never really begins on the 1st of January for me. It usually takes me about a month to figure out how I want to go about my new year and what I can do to improve my career path/enjoy my time in the world. So, about the time Chinese New Year is celebrated, I am usually reorganized and glued back together. So here are a few trends I want to see in 2019! Some of these trends are super fashionable, some are just downright goofy… and others are on the more serious end. Some are even out of my control. But… what isn’t out of control is my reaction to the subject. So here’s a few zingers! It’s hilarious and I’m sure my friends will be able to come up with some pretty darn interesting puns! I already feel like this trend is already forming. This morning I woke up to the announcement of “The Umbrella Academy” as a show on Netflix. I used to love reading Gerard Way’s crazy Umbrella Academy comics. Earlier this year I discovered an Indie Comic called ,”Motor Crush,” and no one I know has heard about it. It’s an INCREDIBLE work of vaporwave, cyberpunk and motorcycles all in one. I recommend it. “Paper Girls,” is also VERY beautiful comic by the same creators. To elaborate a little more on “Motor Crush,” it’s a comic about a young adult named Domino. She wants to race professionally but doesn’t have much reputation yet. She’s definitely not perfect to her friends and family, but she means well. The night racing scene in the first whole volume is my favorite, and I want to cosplay every female character in it. They’re all very powerful and have super cool designs! A friend recently approached me and asked about their depression. Interestingly enough, they hit me up when I was having a panic attack and they sent me an article that answered every question I didn’t know I had. And the entire article solved my problems. I was being too stubborn because I didn’t want to ask my friends for help. I HATE it when people ask me, “let me know if there is anything I can do.” The reason why is because it’s putting so much responsibility on me when I’m already weighing much on my mind. But, this article helped me realize what I myself can do to have my friends help. It’s also a wonderful tool to feeling closer to your friends and family when you feel like there’s an unspoken divide between you. I kind of renewed my relationship with my mother because of this. Also, if you feel like you don’t have any friends or family, reach out anyway. Don’t make excuse to yourself to not reach out. You need to open the door for them, because your friends and family don’t always know whats going on in your head. I feel like whenever people on social media post an article about Politics… emotions always rise up, and people blame the side that they do not particularly agree with. Would it be so difficult to see the other person’s side of the story? Sometimes, both parties are right and both parties are wrong! Forgive me if this particular trend seems a little blind, but I feel as though people get overly emotional about Politics. Another thing is that when something doesn’t go someone’s way, I noticed people on Social Media tend to blame a Political party for their actions… The worse part is, they are not joking. That gets me. Politics are VERY important. I beg of you readers, try to put your emotions aside for these discussions and approach them logically. The reason this particular trend has been posted is because I myself want to see people stop hating one another over Politcal differences. Some people support a wall. Some do not. It’s honestly not the opinion that should matter, it’s your approach to how you treat yourself and others that reflects. Also, if no one is getting hurt or no one intends to hurt someone, then frankly, none of it is your business to attend. We are AMERICANS (my usual readers). We all have the same end goal. Just different approaches to going about them. Focus on yourself most of all. I feel like people who are super involved in politics forget to take care of their own self. And.. forgive me if I am wrong. But I do feel like it’s creating health issues for some. That’s the only point I am trying to make here. Every alternative clothing site I visit other than GoodGoth and Vampirefreaks just don’t have a professional looking website, so finding an alt shop for undergarments is hard. The sites usually look like they’re from 2003. It’s gross and disgusting and unappealing to customers. I shop from AdoreMe. It’s a great site. But, I miss the bras Hot Topic sold back in 2008. Now… those bras were VERY uncomfortable, but they were extremely cute on print. Can we bring those back? I can only do so much as one person! They had pin-striped bras with the brightest colors, skulls with bows. Plaid. This picture helps me show a great example to how cute these were! If we could create or Found a company that has these cute styles, but are comfortable and fit well. that would be GREAT for alt fans. One day I was walking around Barnes and Noble, looking for a planner. I ended up going across the clearance of “Stocking Stuffers” and saw a Zen Garden. I wish I had enough money to buy a gazillion of them. I want to give them to friends and family. I think it’s great to put on on a desk and I heavily rely on mine. 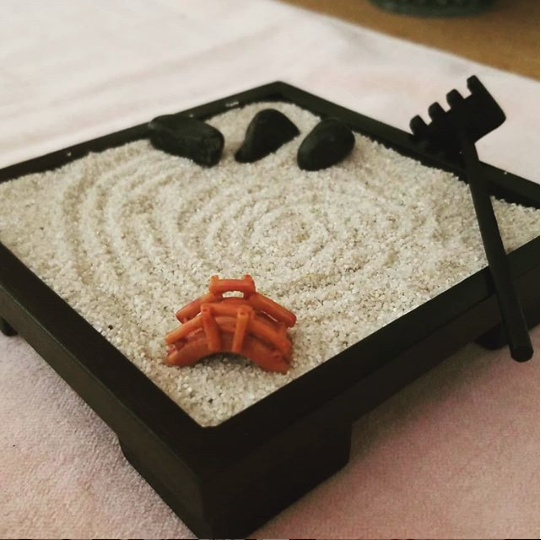 There have been a lot of days lately where I cry a lot due to stress (which is healthy and I am okay) and I take my Zen Garden out to stop the world around me. My garden may not look super top-tier creative, but this photo was my first ever attempt. It comes with a book and talks about technique, which is helpful. The most important part is that it’s soothing watching the sand shift and the bridge immerses me enough to feel like I’m in another place for awhile. That’s really important to me because I work at home and most of the time feel very trapped, even when I am not. Something I have noticed in my friends is that they only show their friends cosplays of people they have never met. That’s fine and dandy, but wouldn’t it be nice to have very small cosplayers get more well-known by just your own community? Keep in mind before I say this, that these are examples to help you get a better idea of what I mean. Whatever these cosplayers intend for themselves is their business and not mine. THIS is hypothetical and their decisions on support, is their’s and their’s alone. My friend Storybook Darlings is pretty well-known by the local community for her talent in wigs and sewing, but friends from out of town have no idea how incredible Darling’s work is! I feel like with everyone she knows and sharing her work, she could probably get a very nice National following (if she desires such). Then there’s ZorbaZombie. She’s newer to the community but a very talented seamstress. Some people know her pretty well, but locals hardly seem to recognize her craftsmanship and she deserves to be appreciated just as much as Storybook. From then, she, too could have a very big National following. I myself have a decent following in Hawaii because my fans and friends instantly clicked with me at the gathering I hosted at Kawaii Kon. I found my niche, so I network in their area the most and sometimes network with my Twitch pals. It ended up helping me with this business. I just think that we are more than welcome to support big name cosplayers… but we should be more comfortable with sharing our friend’s work ten times more often. And I want my local cosplay friends to know that they shouldn’t doubt themselves. If you think about making a cosplay page, please. Just do it. If it’s not for fans, you can at least use the albums for wonderful memories and collections of your art. That’s how I started off! I just wanted to keep my memories organized. I also wish to see more male friends getting comfortable with this social media concept. Imagine what we all could achieve as a community! Sunday: Plan out my week and set small goals and play DnD. Saturday: A day to shop, appreciate your favorite sport or go on an epic adventure with friends! Granted, sometimes I have to cancel these. Just think, though. If you have these as goals for your downtime… then when you do have downtime you’ll know what to do to enjoy it. If you cannot do a hobby each day, just pick a specific day for one each week. It will help you feel happier. The beautiful Unicorn Ornaments Cheryl makes! Trend 10: If you want it. Go for it. Don’t ask for validation. Recently, friends of mine keep posting on Facebook about wondering if they’re good enough to sell their things between shirts, drawings, ideas and crafts. Here is your answer: YES. If you appreciate your own work, chances are, someone else will, too. Just start an Etsy, a Patreon and ArtStation. You can even just sell on Facebook! My friend, Cheryl put her ornaments on facebook and she sold out. Open that door for others and make people aware your product exists. No one has to buy it, but at least you gave others the opportunity to think about it. If the product isn’t up for sale, no one will buy it. It kind of is a reason I felt inspired to make my own website. I want to show my friends that they can do it alongside me. Flare is always on people’s backpacks.. but I don’t feel like I see it anywhere else? Listen, I have a billion pins and buttons. they’re cheap and amusing. Also, wonderful gifts. But seriously. WHAT ON EARTH, DO PEOPLE DO WITH PINS AND BUTTONS? So.. I ended up putting them on my apron at Sally Beauty. Everyone loved the idea, but people actually kept stealing my apron because of that. It upset and and I had to hide it from my co-workers. Then one day, my friend Ari gave me a cute “Lived Cute, Died Cute.” pin. So I put it on the checkered skirt I was wearing and the idea was born. I put them on my skirts now for some variety. They’re too heavy on shirts and I don’t wear jackets much. I have a billion other trends I want to state, but these I feel are the most important/most fun for 2019. Is there anything I posted that you want to try? Did you get an idea? Did you grab a meow word? I hope I inspired you a bit, one way or another. Let me know your thoughts! More pixie and faerie lore needs to happen! Zombies and vampires have become overdone and we need a new paranormal/supernatural obsession to rule the next few years. I would say aliens need limelight, but that was accomplished in the retro days. Warlocks and witches in the 2000s. It’s time for pixies!! Just got back from an Area 51 gift shop so I hyped af over aliens. I dont feel there’s enough hype for cyberpunk though, maybe the 2 can blend. The flair is such an easy touch and can really brightens the wearers mood. Read the perks of you supporting me as a cosplayer and getting me to Kawaii Kon 2019! My mission, as a local cosplayer, is to show the local community that they are valuable and can do anything they want as long as they believe in themselves! I also want to promote passionate content creators in my local and online community as much as myself. My goal is looking to raise enough money to go to Kawaii Kon 2019 and to continue to make wonderful cosplays for the community! I want to help expand and inspire others. I respond to emails as quickly as possible. I am easiest to get a hold of on Monday-Friday. Copyright © 2019 - CactusSquirrel - All rights reserved.